TORONTO, October 16, 2014 — Toronto Real Estate Board President Paul Etherington announced that residential sales reported through the TorontoMLS system during the first 14 days of October were up by 12.2 per cent compared to the same period in 2013. 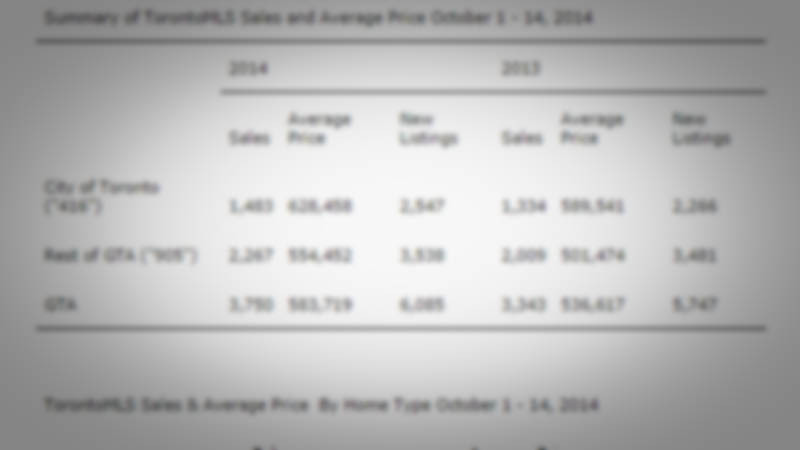 Over the same period, new listings entered into TorontoMLS were up by a lesser 5.9 per cent. “We have seen a strong hand-off from the third quarter into the fourth quarter, as sales for all major home types were up. This suggests that a great diversity of home buyers remain active in today’s market, from first-time buyers looking for affordable home ownership options through to high income households looking to purchase a luxury property,” said Mr. Etherington. The average selling price for sales during the first two weeks of October was $583,719 – up by 8.8 per cent compared to the same period in 2013. Overall price growth continued to be driven by the low-rise market segments, including detached and semi-detached houses and townhouses. “Strong annual rates of price growth for low-rise home types were sustained, as sales growth continued to outpace growth in new listings. Sellers’ market conditions are expected to remain in place for the remainder of 2014 and into 2015 as well. This means that high single-digit rates of price growth for singles, semis and townhouses will likely remain the norm over the next few months,” said Jason Mercer, TREB’s Director of Market Analysis.